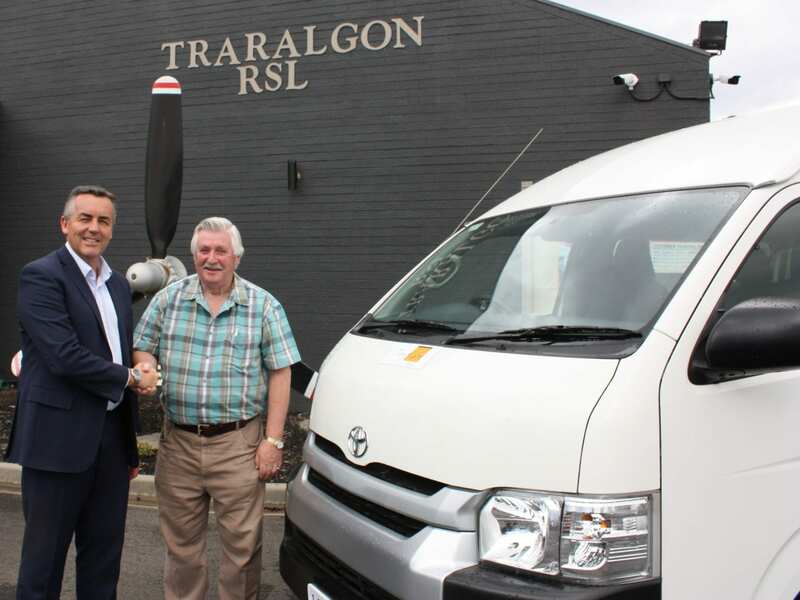 The Federal Member for Gippsland Darren Chester congratulates Traralgon RSL President Ron Culliver on the purchase of a bus that will help reduce the social isolation experienced by veterans. Social isolation experienced by veterans after they leave the defence forces is a serious issue facing many Returned and Services League sub-branches around Australia. In Traralgon, the RSL is tackling the issue by bringing local veterans and their families together for social activities and outings. And it will be doing so with a new community bus bought with more than $40,000 from the Federal Government. Federal Member for Gippsland Darren Chester, who is also the Minister for Veterans’ Affairs, said the 12-seat bus would allow the club to expand its current activities to include organised day trips. “Traralgon RSL has a well-deserved reputation for its commitment to improving the lives of those who have served our nation,” Mr Chester said. “It is doing so in practical and tangible ways, such as arranging day trips and other activities for veterans and their families. The Traralgon RSL is one of two community organisations in Gippsland to receive funding through the Federal Government’s Veterans and Community Grants Program. The Lakes Entrance Men’s Shed received almost $3700 to buy a television and computer equipment to be used by visiting guest speakers and presenters. The Traralgon RSL and the Lakes Entrance Men’s Shed were among 62 community groups across Australia to share more than $824,000 in the latest round of the grants program. Ex-service and community organisations, veteran groups and private organisations which contributed to the health and welfare of the veteran community can apply for funding in the next round of the grants program. For more information, visit communitygrants.gov.au . The current round closes at 2pm on February 28.